The instrument ground school will soon come to an end, so I thought it might be time to start flight training. 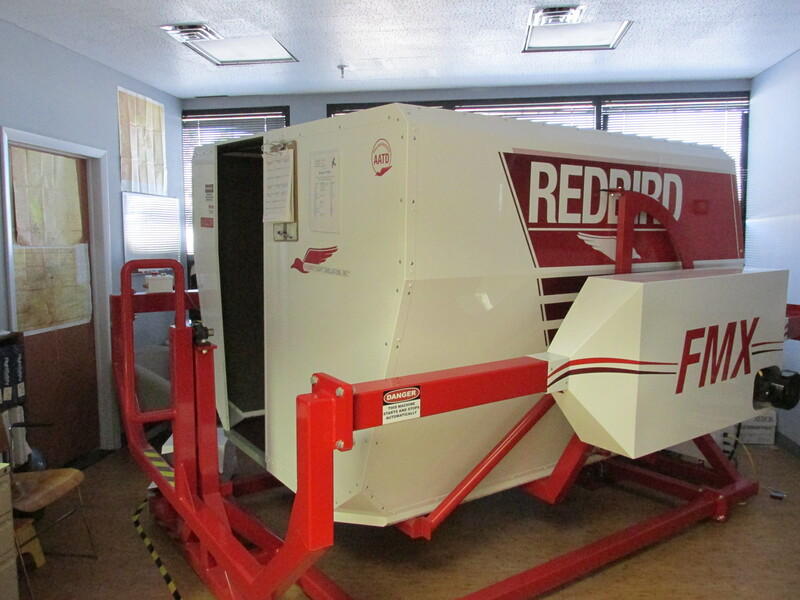 I had a lesson in the Redbird FMX full motion simulator which will be the training device for my first ten hours in instrument meteorological conditions. We called it an introductory flight but there was already a lot to learn. We started with a few simple exercises like straight-and-level flight, climbs and descents. I felt pretty comfortable because these things were already part of the PPL course in Seattle. Also my instructor could tell that I flew a lot in MS Flight Simulator before so we took the training a step further. I had to fly the Oscar Pattern. 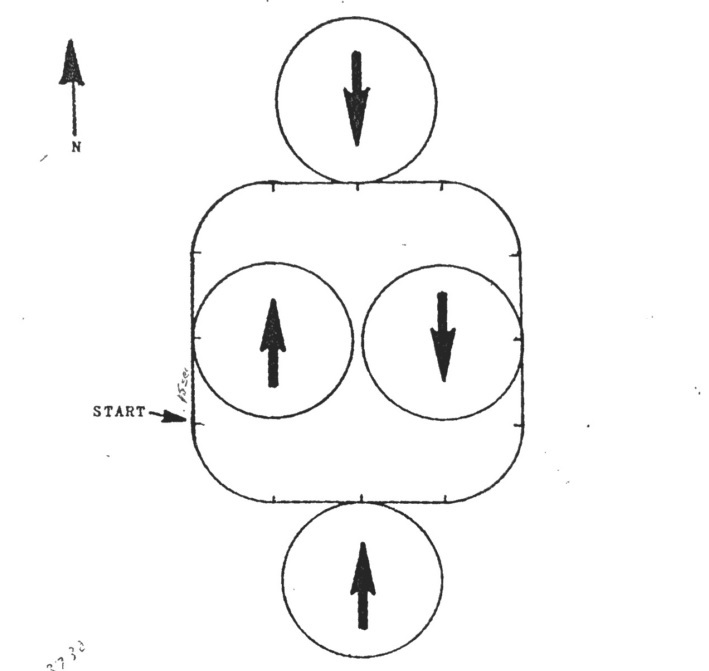 Each marked part is 15 seconds, each circle 2 minutes, each turn 30 seconds and the exercise should take 12 minutes. The arrows indicate a climbing/descending turn. It is a great exercise because there is a lot to do at the same time and the student has to keep track of time. The point of it was that I had to move my attention between the instrument scan and the stop watch. Sounds easy but it really is a brain exercise for someone new to this. The picture below shows the flight analysis from FSX. 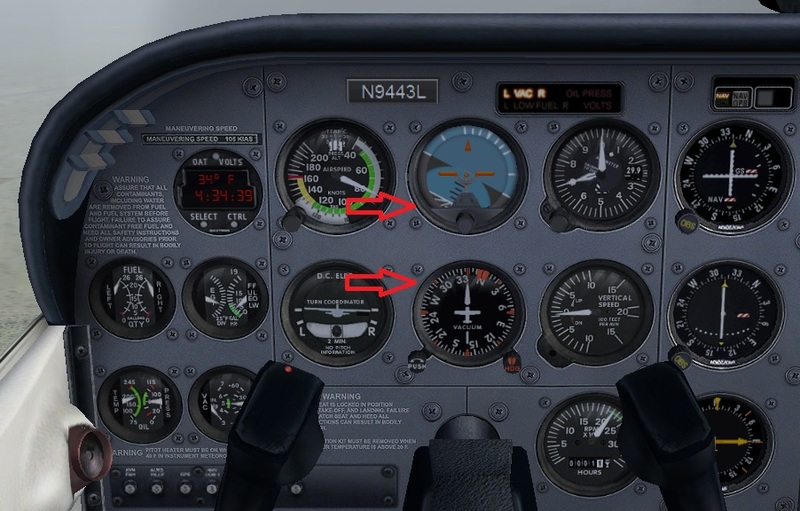 Even after some practice it is still hard to fly the pattern correctly. It is easy to become complacent and then suddenly I have to rush and do mistakes. A few things from ground school start to make sense now. Different scanning techniques are such an example. I read many times that you should think about which parameters you want to be constant and now after a little practice it makes perfect sense. During my first sim session Josh, my CFI, didn’t want me to think it was too easy so he failed the vacuüm pump. This vacuüm is the driving force for the gyroscopic instruments, usually the directional gyro or heading indicator and the attitude indicator (red arrows). My brain was really tricking me – I kept looking at the unreliable instruments and struggled to keep the airplane under control. To make it worse I had to use the magnetic compass (German ugs., Schnapskompass) and think about its errors during turns. The acronym for that is UNOS, undershoot north overshoot south. During a turn a magnetic compass is only accurate when passing through a east or westerly heading. Thus it is easier to time the turns, which are always done at standard rate: 3 degrees per second. A 90 degree turn divided by 3 equals a 30 second standard rate turn. Start the turn and stop watch and after 30 seconds – if flown accurately enough – you end up on your desired heading. During the exercise I became so confused by the false indications of the failed instruments that my CFI had to cover them with post-its. Now after flying some time at home I get better at it but I certainly see the danger of that instrumentation failure in instrument conditions. I suppose that if you are a bit behind the airplane this situation could become very serious. Well, that is at least motivation to study and a reminder that pilots should always fight complacency to stay ahead of the game.